It’s funny what gems can crop up when immigration is concerned. 2006’s Booker Prize Winner, The Inheritance of Loss, dealt with the issue fairly heavily, and look where it got? Nevermind that i don’t like the book – i’ll run a review sometime later. 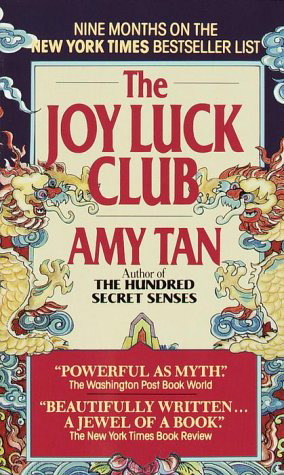 The Joy Luck Club, however, written by Amy Tan and published in 1989, is one of those books that remain as relevant today as it was a decade ago. I like it. A lot. Joy Luck can almost be called a book of short stories, and if the author’s note is anything to go by some of the stories have been published in woman’s magazines. The book opens with one from Jing-Mei Woo (“June”)’s perspective, just after her mother’s death, and we’re quickly ushered into their world of clashing cultures, and of the tender and sometimes fragile bond linking mother to daughter. There are four families in the book, four sections, and four stories per section. The first and last sections of the book are written by the mothers (with the exception of June, since her mother has passed away) and the middle two written by the daughters. It’s nicely structured and the interlocking stories give a sense of balance to the narrative. The Joy Luck Club is populated with well developed, fleshed out characters that i understood and cared about. But not all of them is clear and believable … Ying-Ying St Claire, for example – her story is convoluted with wishes, symbolism and depression, making me unsure of what the author was trying to convey. But the others, especially Waverly’s talent in chess and June’s and her deceased mother’s relationship, struck a deep chord with me. You know where these characters are coming from, and everything they say and do makes sense, especially the chinese mindset portrayed and detested by the daughters. Amy Tan does a commendable job of portraying the clash of two cultures – Chinese and American, and its effects on the characters. Another theme you see running throughout the book is that of redemption, of daughters running astray from their mothers and trying to make up for it. There’s no action in this book, if you’re the kind of reader constantly hooked to thrillers. Or if you don’t have enough time – but then again this book is suitably short, and very, very sweet. Read this. I don’t care. Read this.